Symphony #9 "From the New World"
Leo Janáček: Suite "The Cunning Little Vixen"
Collaboration between EMI Classics and IMG Artists has led to the creation of Great Conductors of the 20th Century, a series devoted to some of the great (and late) conductors of the previous century. By working with other labels, EMI and IMG have been able to dig deep and to bring many unusual recordings forward; many have not appeared on CD until now. 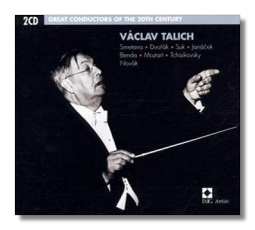 For many decades, there were collectors who would not think of hearing Má Vlast or one of Dvořák's late symphonies unless it was conducted by Václav Talich (1883-1961). To pigeon-hole Talich as a specialist in Czech composers is to risk making him a provincial figure, but in truth, his career's focal point really was the music of his homeland. Only two of the selections on this two-CD set are by foreign composers, and one might argue that Mozart was an honorary citizen of Prague, as it was in that city that Don Giovanni was premièred! Talich was not a showy musician, and perhaps his greatest strength, apart from his natural talent as a conductor, was his dedication to presenting idiomatic performances of music with which he had a personal relationship. Before World War Two, Talich and the Czech Philharmonic made 78-rpm records for HMV in London; after the war, they recorded for the Czech label Supraphon. All of the selections presented here come from the latter period – 1951-54, to be exact. Many of these are commercial recordings made in the Rudolfinum, the Orchestra's sonically superior hall. (The Water Goblin and Mozart's Symphony #33 are live recordings deemed superior to his studio efforts.) Political difficulties in Communist-controlled Czechoslovakia prevented Talich from conducting the Czech Philharmonic for a period, and so he also worked with (in fact, founded) the Slovak Philharmonic. His work with that group is commemorated by the excerpt from Tchaikovsky's "Mozartiana" Suite. For my tastes, however, the most treasurable performance here is of Suk's Serenade for String Orchestra, a golden work which takes Dvořák's own string serenade as a model and shades it with late Romantic colors. This 1951 recording is so beloved that, for a time, it was played every Christmas eve by Czech Radio. The sound on this set is variable, but mostly good, especially in the later commercial recordings. The live recordings tend to be a little rough around the edges. 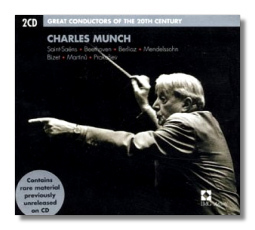 Charles Munch is remembered by American collectors for the records that he made with the Boston Symphony Orchestra between approximately 1951 and 1962. His Bostonian Berlioz, Debussy, and Ravel still maintain their hold on many allegiances. (For example, in my opinion, no one has surpassed his Berlioz Roman Carnival Overture.) The present collection reminds listeners that he made many fine records in Europe both before and after his years in Boston, right up until his death in 1968. Munch is commonly referred to as a quintessential French conductor, but he was born a German citizen in Strasbourg in 1891. (At that time, the Alsace-Lorraine region still was under German control.) He spent much of his early career studying violin in Paris. However, he also served as concertmaster in Leipzig under both Bruno Walter and Wilhelm Furtwängler. A late bloomer on the podium, he was already in his 40s when he made his conducting debut in Paris. His interpretations are often exciting and spontaneous – Munch was seldom the same twice - yet not lacking in discipline and attention to detail. This collection of studio recordings contains much to enjoy. His "Choral" Symphony from 1958 is wonderfully masculine and propulsive, and were the singing in the finale a little better, it would be a first choice. The Saint-Saëns overture is an appealing rarity, recorded at one of Munch's first sessions in Boston. The Martinů reminds us that Munch was a quiet advocate for modern music; this underrepresented work was commissioned for the Boston Symphony Orchestra's 75th anniversary, and Munch's recording – difficult to find until now – remains the best. The Bizet, recorded as late as 1966, is brilliant yet warm. The Prokofieff excerpts are less successful, and the Mendelssohn, though brilliantly played, doesn't really work when it is played by a full orchestra. The sound on these recordings is good, for the most part; the Berlioz (from 1948) sounds harsh, and the Prokofieff and Martinů are dry. 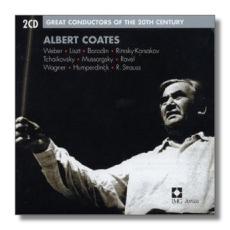 Where Richard Wagner's music was concerned, Coates's conducting was even more electrifying. (It is not too far-fetched to compare Coates with Sir Georg Solti, although Coates seems to have been the more spontaneous of the two.) The orchestral excerpts included here were recorded in 1926; the Love Duet from Tristan und Isolde came three years later. Not only are these strikingly well recorded, their dramatic fervor makes them unmistakably the work of a conductor who had experience in the opera house. One curiosity comes in the "Entry of the Gods," with what seems to be the entry of a wheezy old organ near the end of the excerpt. Leider and Melchior – the latter in particular – are at the top of their form in the Love Duet, and rarely made a recording as vivid as this one. In the mid 1940s, Coates and his South African-born wife settled in that country, bringing his commercial recording career to an end. However, he continued to conduct there, and Coates remains a famous conductor in South Africa, where his legacy still is honored. All of the recordings in this collection date from the electric era; earliest (March 1926) is the Ravel, which is furious if not completely polished. Latest are the Liszt and the Rimsky-Korsakov, from October 1930. It's surprising how well these recordings have stood the test of time, both sonically and interpretively. There's a lot of excitement left in those old shellac grooves!